Rainwater runoff from gutters and downspouts can cause major damage to your home's foundation and landscape if not properly diverted. Install the MOLE-Pipe downspout extension on all of your downspouts to channel rainwater away from the foundation and landscape. Connect multiple units to extend length beyond 6 ft. Replace downspouts permanently! 2 In. x 3 In. x 10 Ft. lengths. Crush-proof! Dent-proof! No sealants or caulking! Fast, easy installation! Downspouts channel rainwater runoff to prevent garden erosion and foundation damage. Durable vinyl. Engineered to withstand North America's worst conditions (-40? to 150?F or 65?C) . Maintenance-free! Never needs paint! Cleans with a hose! Guaranteed for life! Install the FLEX-A-SPOUT Downspout Adapter over the outside end of your downspout and push up for a snug fit. Attach the rounded cuff end to 3 in. or 4 in. Corrugated pipe, 4 in. PVC or your choice of FLEX-A-SPOUT accessories with a simple snap fit. 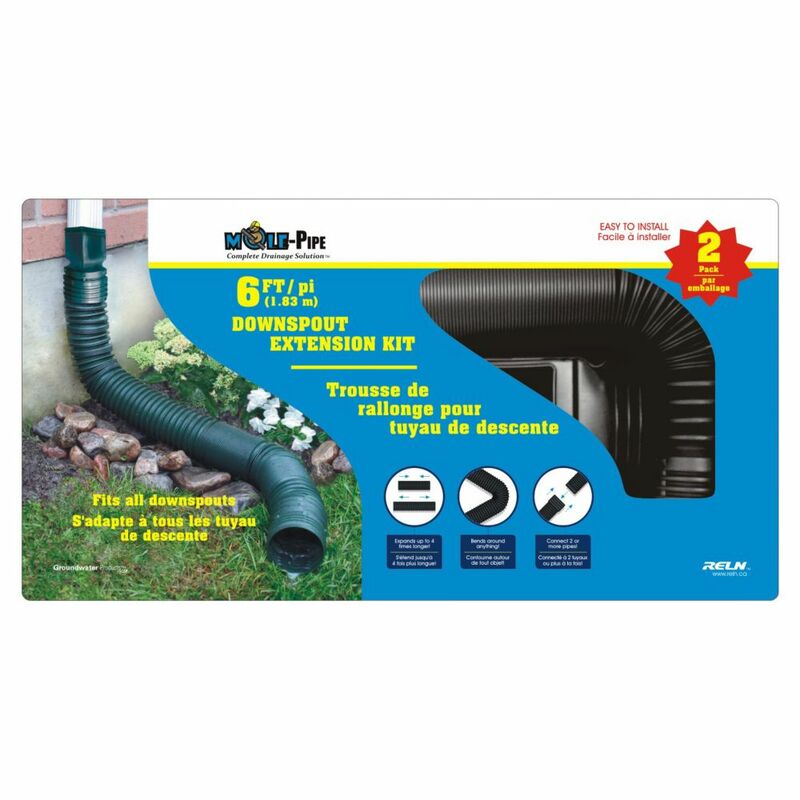 Mole-Pipe 6 Feet Downspout Value 2 Pack Rainwater runoff from gutters and downspouts can cause major damage to your home's foundation and landscape if not properly diverted. Install the MOLE-Pipe downspout extension on all of your downspouts to channel rainwater away from the foundation and landscape. Connect multiple units to extend length beyond 6 ft.
Mole-Pipe 6 Feet Downspout Value 2 Pack is rated 4.3 out of 5 by 3. Rated 3 out of 5 by drkmoore from Not Black as shown in picture Picture shows black inside the box but this is GREEN not Black - wish I would have know... Oh well I have green extender on my black downspout. Rated 5 out of 5 by MichelMartell from Fits very well. I bought this and fits very well. Great product!!! will this fit a 3x3 downspout? What color are these? The picture shows green but I also black.